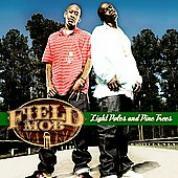 RapReviews.com Feature for June 20, 2006 - Field Mob's "Light Poles and Pine Trees"
Proud of their Southern roots and fresh out of Albany, the Georgian duo Field Mob have enjoyed a moderate level of success and notoriety with albums like their 2000 debut "613: Ashy to Classy" and 2002's "From Tha Roota to Tha Toota." For unexplained reasons though the group took a three year hiatus before resurfacing in late 2005 on Disturbing Tha Peace's "Ludacris Presents... Disturbing Tha Peace." Now apparently signed to Luda's DTP label imprint, Shawn Jay and Smoke made their return loud and clear by starring on the aforementioned album's first single "Georgia." Under that Carolina to Tennessee, you'll see ("Georgia")"
Break up never, they just jealous! They hate to see you doin better than them, so!" Behind tent gettin bent just smokin 'dro"
But I gotta go befo' my flight leaves me"
Field Mob's "Light Poles and Pine Trees" can indeed be called a successful return after a long absence, but to be perfectly honest absence did not make the heart grow fonder. As much as I enjoyed "From Tha Roota to Tha Toota" I wasn't exactly worried when they disappeared and didn't return, because it's far too easy for a group to drop one great album these days and vanish. Sometimes it's lack of label support, sometimes it's "artistic creative differences," sometimes it's because somebody got sent up on a jail bid. With DTP and Ludacris behind them though Field Mob doesn't have to worry about a lack of support, and since they don't express an excessive enthusiasm for negative behavior on their CD it's unlikely either will be doing a long sentence any time soon. All they have to do is stay together and keep getting better and this could be the start of a whole new run with many more promising albums to come.